(CBS/AP) Are doctors blood transfusion-happy? In the U.S., some docs are ordering blood transfusions for non-life-threatening conditions, risking patients' lives and reducing the nation's blood bank supplies. Now a government advisory committee is calling for national standards on when a transfusion is needed - and how to conserve this precious resource. Advisers to Health and Human Services Secretary Kathleen Sebelius said "there is both excessive and inappropriate use of blood transfusions in the U.S."
Blood banks are also on board with the need for guidelines, as they try to balance how to keep enough blood on the shelves without it going bad or running short. "Better patient care is what's being advocated here," Dr. Benjamin said. "If a transfusion is not necessary, all you can do is harm." The U.S. uses more than 14 million units of red blood cells a year. Between 1994 and 2008, blood use climbed 40 percent, Benjamin told the HHS Advisory Committee on Blood Safety and Availability. But parts of the country experience shortages each year as blood banks struggle to bring in enough donors to keep up. Overall donation levels are good, but there's a big need for Type O-negative blood, especially as banks prepare for the usual summertime donor drop. Few donors are Type O negative, but it's compatible with all other blood types and hospitals have begun using more of it in recent years. Studies highlight the unnecessary number of transfusions docs are doling out. One published last fall tracked more than 100,000 open heart surgery patients. Just 8 percent of them received transfusions at some hospitals, while a whopping 93 percent did at other hospitals. Survival wasn't significantly different at hospitals that used more blood than at hospitals that used less. That's important, because transfusions can be risky. While the risk of transfusing blood infected with HIV or other viruses is rare compared to the past, people may experience allergic-style transfusion reactions and other potentially fatal complications. Overall, the U.S. uses about 49 units of blood for every 1,000 patients, substantially more than Canada or Britain, where those transfusion rates are in the 30s, Benjamin says. How can doctors avoid transfusions? 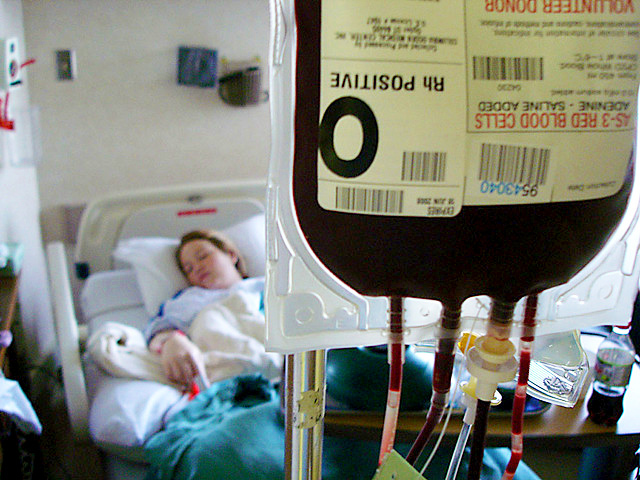 HHS advisers urged the government to explore a "patient blood management" solution to determine when transfusions are avoidable. At Eastern Maine Medical Center in Bangor, doctors order blood via a computerized form that warns if they're about to deviate from the guidelines and tracks who uses the most blood. For example, patients are supposed to be checked for anemia before elective surgery - like a hip replacement - is scheduled, so they can be treated with iron or other therapies beforehand to lower the chances of a post-surgery transfusion. For non-surgery patients, other guidelines spell out when anemia is bad enough to warrant a transfusion or when a patient should just be monitored. In cardiac and back surgeries, equipment captures a patient's own blood and pumps it back right away, reducing the need for post-surgery transfusions. The program reduced the amount of blood drawn just for laboratory tests, and limited when doctors can order multiple transfusions rather than checking first to see if one did the trick. As a result of these measures, The Bangor hospital is giving blood to nearly half as many patients as it did in 2006, the year before the program began. And there are no signs of patient harm, according to the hospital's Transfusion Chief, Dr. Irwin Gross. He calculated that the hospital saved $5.4 million over four years in the cost of buying blood. The Mayo Clinic has more on blood transfusions.